Every now and then, we readers are lucky to discover a writer who vibrates to our frequency, who seems so uniquely attuned to our thoughts and feelings that the incidental barriers of time and place are torn down and we are left to commune freely with someone we recognize as being, in some important sense, like us. It is the only out-of-body experience I’ve ever known, and it’s achieved not through meditation, or psychedelic drugs, or blunt force trauma to the head, but by words – words arranged in a particular way, with care and with intention, words designed to provoke, elate or challenge, but nonetheless mere words. 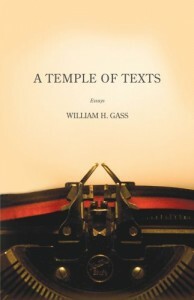 The title of William H. Gass’ 2007 collection of literary criticism, A Temple Of Texts, goes some way to conveying the spiritual experience of reading that leaves so many of us worshiping literature with the same studious devotion that priests and rabbis trawl testaments old and new. Better still, the essays within don’t just convey an appreciation for literature; they compel our appreciation, our admiration, for a man whose life has been spent between the pages of an opened book. When coined in the reign of Servius Tullius during the sixth century B.C., it meant the group, among citizens, to be called upon first; that is, during a time of war, the strongest, boldest, bravest, most fit to fight; while, when the state faced choices of difficulty and moment, the wisest, most temperate, and fair; so that then, when it was used of writers, it referred to those of the first rank, and also, by an obvious step, to their works. Therefore it should now designate, with regard to the education of a citizenry still concerned with their community, the books that have most completely represented and embodied its culture, as well as those that will best instruct, enlarge and ennoble the mind, discipline the passions, and encourage a useful and respectful approach to experience. Rabelais writes for the convivial, and consequently for those who must have poisoned their livers and contracted the pox, because syph was the New World’s swap with Europe in their exchange of epidemics; it was the sixteenth century’s AIDS, heedless pleasure’s penance; and, although the clap can now turn on lights, alcohol has never changed its ways. Thus he welcomes us to his feast on what might be Inflation Sunday during Hypocrite’s Holiday, in the year of the Warmonger, 2004, or maybe 1532 – it’s much the same, since swilling, swiving, corruption and conniving, fanaticism, bigotry, and bloodshed haven’t changed, and the sports bars are still full of opinion. Read it aloud. Savour the rhythms, the repetitions (convivial, consequently, contracted) and juxtapositions (syph, swap), the alliterations (pleasure’s penance) – and then consider that his blurring of the lines between old and new, between yesteryear’s syphilis and today’s AIDs, between the warmonger of 1532 or 2004, is the argument that justifies the eventual summary “it’s much the same,” and Gass’ guarantee that Rabelais, by writing about his time, was writing for all time. This is indeed prose to get fat on, and there are 400 marvellous pages of it.